The house is clean. No more starlit trees sparkling in dark corners at night. No more Wise Men to inch ever more closely toward the manger. No more cookies, dark chocolate truffles, cups of cocoa with a peppermint stick to drink whenever anyone wants. Christmas is definitely over Chez Bellezza. But, with the end of 2010 comes the promise of 2011, and the promise of new books to be read, discussed and discovered. That’s such an exciting prospect! When I started my blog, it wasn’t even a book blog. Sure, I’d post on the occasional novel I’d been reading, but mostly I wrote posts chronicling my thoughts. My life. Yawn. Much better to talk about a common theme with those who love it as deeply as I do. Then, when I’d nicely established myself on Blogger, I got bored and hopped over to WordPress. For my year long stay there I met wonderful bloggers I hadn’t known, but I felt like I lost touch with many of my blogging friends from Blogger. I got frustrated with stats In My Face every time I opened my dashboard; I decided to hop back over to Blogger where I’m staying. In the process, I’ve gone from reviewing books that only I chose, to books that I chose specifically for a challenge, to books that an author or publisher had requested I review. I’m swinging back the pendulum now, rather like teaching, to return to where I started: reading mostly what I want when I want to read it. Hmmm, sounds a bit selfish, but it is, afterall, my blog. It is my not unlimited reading time. I want to read all the rest of my Murakami novels. Own them all, have read only about a third. I want to read the books my main book club selected: Lucy, Astrid and Veronika, Out Stealing Horses, Confederates in The Attic. I want to read short story collections, something I never do; after reading Tony‘s praise for the Oxford Book of Japanese Short Stories, and Haruki Murakami’s praise for Raymond Carver, I purchased both collections. Love them so much so far. I have a few books I’ve committed to review that seem awesome: Major Pettigrew’s Last Stand. Frank Delaney’s new book to be released in March: The Matchmaker of Kenmare. And, don’t forget that Claire promised us a Persephone Reading Weekend for February 25th through the 27th, so mark your calendars accordingly. Now with Christmas put away, the books come out to play. And I, for one, love this playground! I love that playground too! Happy New Year! Xmas vanishes tomorrow, and I have my pile of new books beside me,Mark Abley's The Prodigal Tongue.Ital Calvino's If on a winters night..Granta,The best of young Spanish novelistsAnd Spanish Literature(a very short introduction) Jo Labanyi. these were pressie's to myself & just looking at them sat beside is as comforting & warming as an open fire. So Loving your pile and can understand its attraction. Oh no, your house is clean? I knew I was falling behind at something! Sadly, that's what I have to deal with this morning when all I feel like doing is continuing my long weekend reading marathon.Can't wait for you to get to the other 2/3 of Murakami. I predict you're going to love it. We're back to pre-holiday status in the house too, and I'm ready to return to "normal" life, whatever that is!I'm focusing on Simply Reading this year too-reading only what I really want to read. I figure my bookish life is somewhere I can be completely selfish without feeling guilty about it! I like your renewed enthusiasm to read for yourself. For a while my reading and reviewing obligations didn't let me get at some of the books I really wanted to read for myself. I've slowed way down the last few months. It feels good. AND one of my goals for this year it to finally open up those Haruki Murakami novels I intended to read for the Japanese Literature Challenge and never got around to- thanks to YOUR dedicated Murakami Reading Challenge! I cleaned and put away all traces of Christmas too today, it fely very refreshing.I'm still at the first stage of your reading 'pendulum' – I'm reading what I want, when I want to with no challenges or review copies. I'm hoping to stay that way, at least for this year. I agree that there is nothing like that wonderful calm after the Christmas excitement. I am anxious to get into my books. I'm holding the Persephone you so generously Secret Santa-ed to me for the February Persephone Reading Week — thanks so much again! I believe I have several Persephone books on my TBR shelf. I love this post! Fresh beginnings indeed. I'm firmly in the "following my own reading path" camp. Glad you are excited about your upcoming books and I'll be around to see what you want to share with us. Hugs and Happy New Year! I didn't realize there was a Persephone reading week coming up soon. Awesome! Oh, me too! I loved Major Pettigrew, and I'd love to read some Persephones. I think it's going to be a great year, for reading at least! Didn't realize there was a date set for Persephone Week – hurray! I still have to 'put Christmas away', but then it'll be time to start Major Pettigrew for my book club. Happy New Year Bellezza. I think reading exactly what you want sounds perfect. It is too easy to get caught up in other things but reading brings me the most joy when I am obligation free. Great post and hope you have a wonderful year of reading!! No, the holidays are still in evidence here. Enjoy your literary playground, Bellezza! I look forward to reading about all the fun you're having there.Happy New Year! 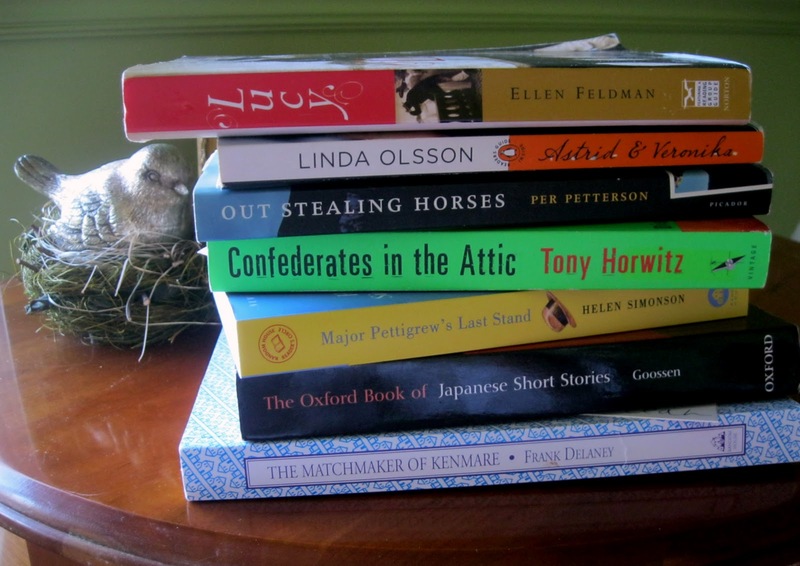 I second Tony's approbation of the Oxford Book of Japanese Short Stories. Enjoy your more personalized reading year! Well, my house is clean but the tree is still up because I will miss it to much if it goes away on the weekend. Will sneak it away a little at a time this week.Love the choices you have in front of you, and very much looking forward to a Persephone weekend.Happy back to school week! My house is..well..mostly clean and I have started sorting through my TBR piles for my January reads. It's back to school tomorrow and I am excited to see the children and hear their holiday stories!Have a wonderful week, Bellezza! I got all excited when I first started book blogging and accepted a few review copies of books…. I wasn't overly impressed with their quality and I felt pressured to read. Reading should not be like that… it should be fun. This is why this year I am no longer accepting review copies and I am not doing any challenges. This year, for me, is about reading what I want to read, when I want! I am looking forward to your Murakami reviews. I received a Murakami for Christmas and will be reading it soon. I am envious that you own all of Murakami's books! You should try and read them all before 1Q84 is released in English. Just marked my calendar for Persephone Reading Week! I have Major Pettigrew's Last Stand in my TBR pile too. I can't wait to read your thoughts on Astrid and Veronika. I read that book for the first time a few years ago and loved it. Happy reading! My plan for 2011 is to read more from my stacks and less from the "New Release" shelves at work and the library. I have Major Pettigrew in mind to read, too. I gave it to my mom last year and she loved it, as did a few of my good friends. Sounds promising.I'm off today, so I plan to turn on some music and clean, clean, clean. Then read, read, read. :)Happy New Year, dear friend! What a wonderful plan – and you are right, we do not all have unlimited reading time (much as we'd like to). Read the books you want to read sounds like the right thing to do.Speaking of Persephone, one of the gifts I received for Christmas was The Victorian Chaise-Longue – I'm excited to read this one based on your review! I love that playground as well and think your shift of focus is a fantastic one. I've been branching out a bit and requesting some specific books from publishers that I want to read, but beyond that I won't be just taking stuff. I'm too much of a whim reader for that. I think this year is definitely about reading what we want, when we want! Wishing you a wonderful reading year. Did I really lose my comment? Dang blogger! 😉 In short–it's been interesting to watch the blogging trends over the past four years, I couldnt be more excited to see so many trending towards reading deliberately and reading classics. Sounds like you have a lovely year ahead of you. Best wishes!